Before the launch of the iPhone 6 Plus, the idea of people being concerned about how “bendy” their phone is would’ve seemed laughable. A week later, I’m hearing random people in my just-outside-of-the-echo-chamber coffee spot talk about it like they’d talk about the weather. Strange. Yesterday afternoon, following complaints of new iPhones coming out of their owners’ pockets bent, YouTuber Lewis Hilsenteger posted a video of himself managing to bend the iPhone 6 Plus without much effort. Today, he’s back with more phones. 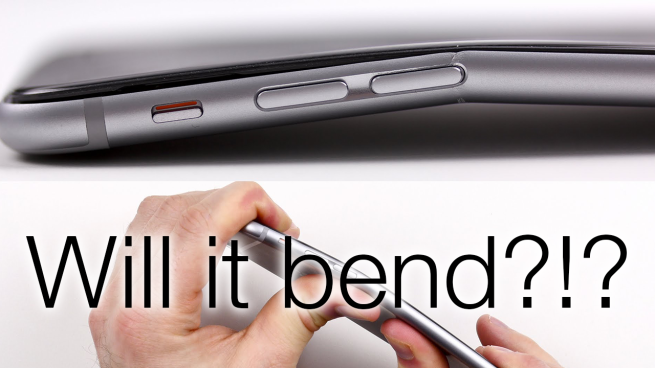 Does the iPhone 6 bend the way the 6 Plus does? What about other aluminum-backed phones, like the HTC One M8? It’s about as unscientific as it gets, but if we’re considering “however hard this guy can push with his bare hands” as a standardized unit of measure, the iPhone 6 seems to fare considerably better than the 6 Plus did. The One M8 groans a little and the screen temporarily jumps out of place, but there was no permanent damage. The 2014 Moto X, meanwhile, seems to put up a helluva fight. If you’re interested in seeing what sorts of things companies do to test their phones against all sorts of different potentially damaging situations, check out these videos I shot of Nokia’s hardware damage labs way back in 2008. A phone’s tendency to bend would likely be tested with something like the machine shown in the over-extension test video.